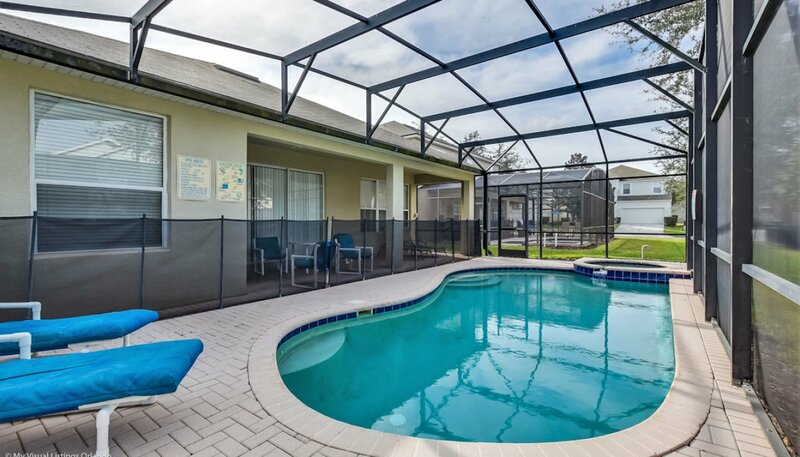 This luxurious 5 bedroom 5 bathroom vacation villa features a large north facing sunny pool with spa, games room with pool table & darts, wireless high-speed internet access and LCD cable TV's throughout. 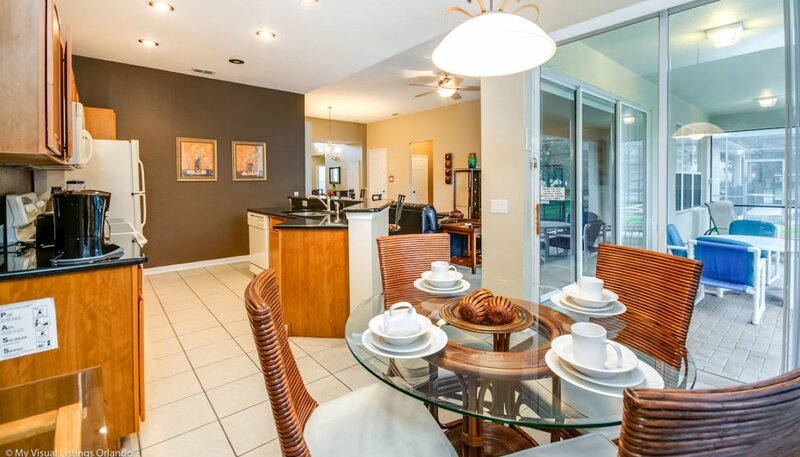 This fabulous villa has been thoughtfully furnished to create a vacation home with a stylish contemporary feel. 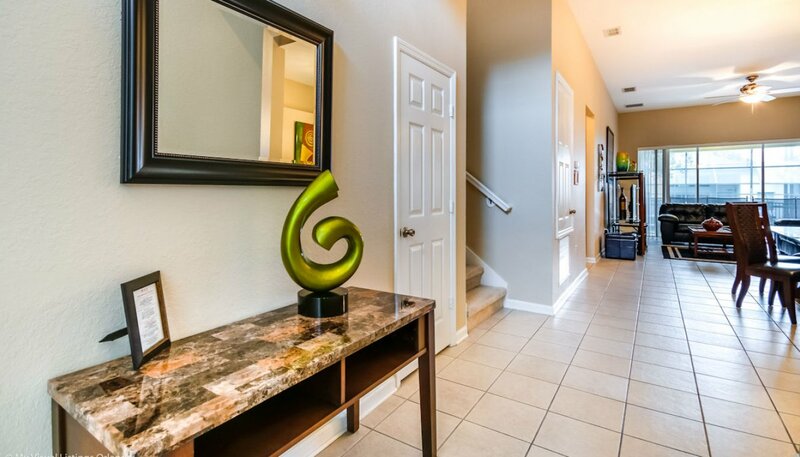 As you enter the villa you are greeted with a fabulous tiled hallway leading off to the master #2 bedroom to the left followed by the staircase. 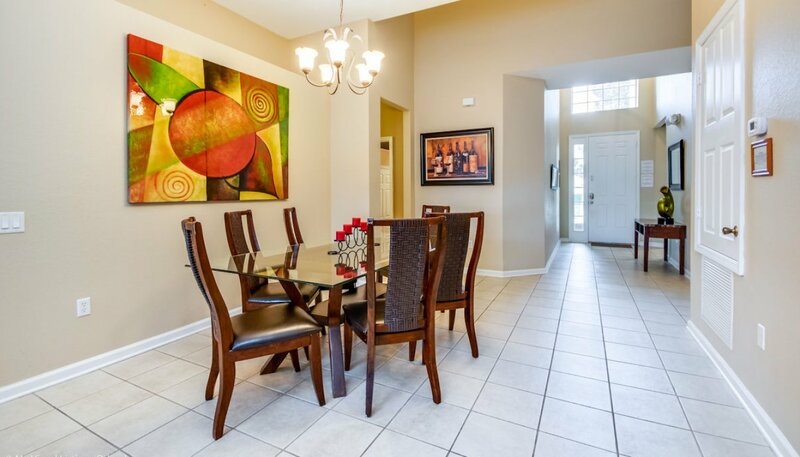 The hallway then leads to the spacious dining area, living room and luxury kitchen beyond. 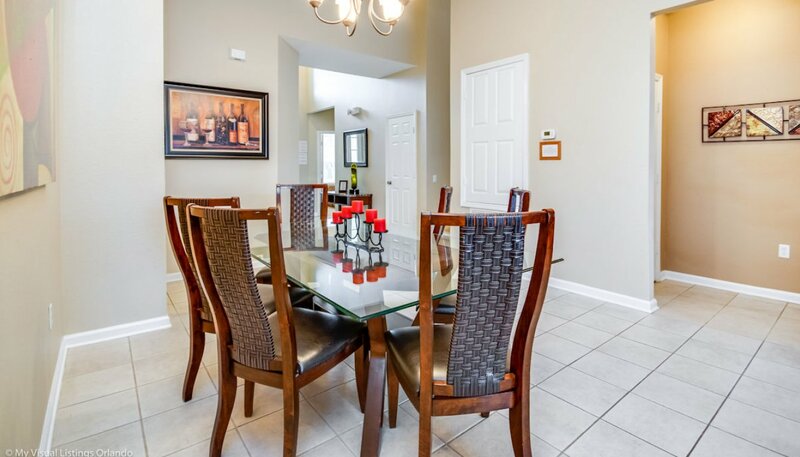 The formal dining area is located adjacent to the living room and has a large glass topped table with seating for up to 6 diners and is beautifully set out for those special dining occasions. 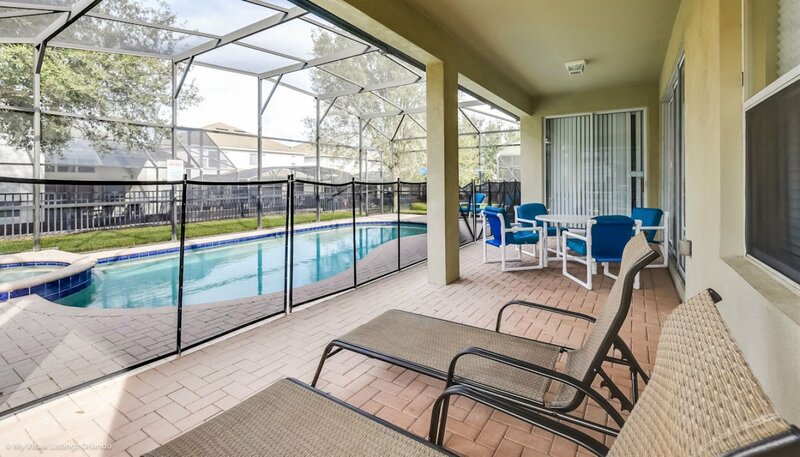 The spacious living room with direct access & views onto the pool is comfortably furnished with 2 classic leather sofas to allow our guests to relax watching TV, a film, or test their gaming skills on the large LCD cable TV with DVD player and PlayStation 3 games console. 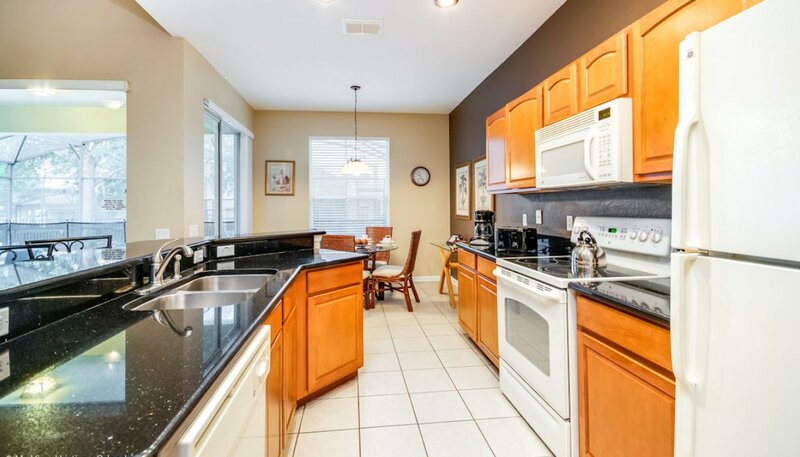 Luxury kitchen with granite counter tops and quality appliances has all the amenities including dishwasher, stove with oven, microwave, refrigerator & freezer with ice maker, waste disposal, coffee maker, blender, toaster & kettle. 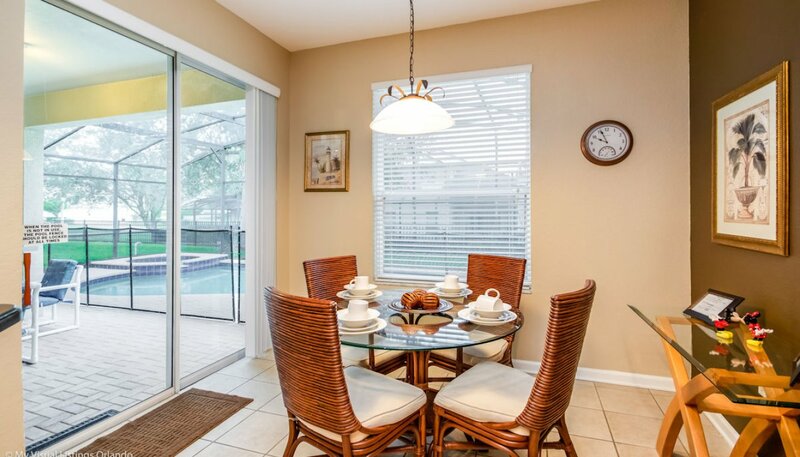 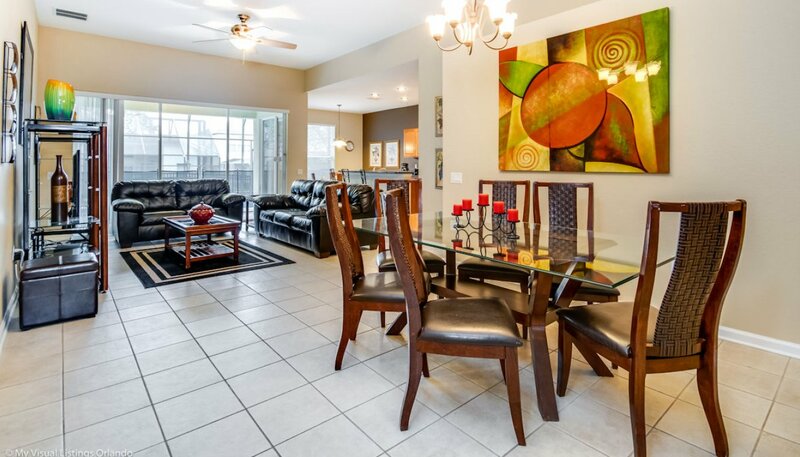 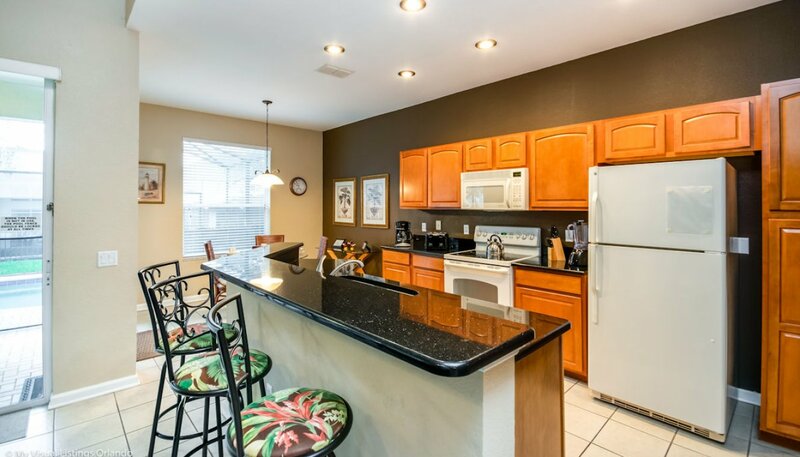 The pleasant breakfast nook with dual aspect views and access onto the pool deck comes equipped with a round table and 4 chairs plus an additional seating on 3 bar stools at the breakfast bar. 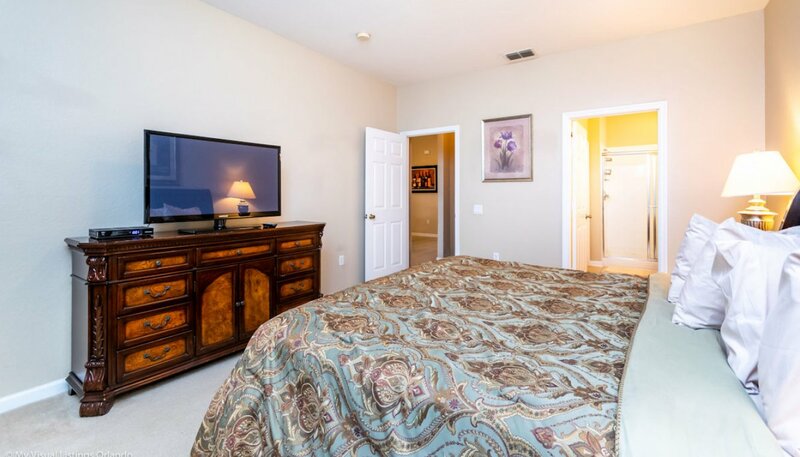 The first master bedroom with views onto the pool deck is furnished with a king sized bed with matching nightstands, chest of drawers with large LCD cable TV above and large built-in wardrobe. 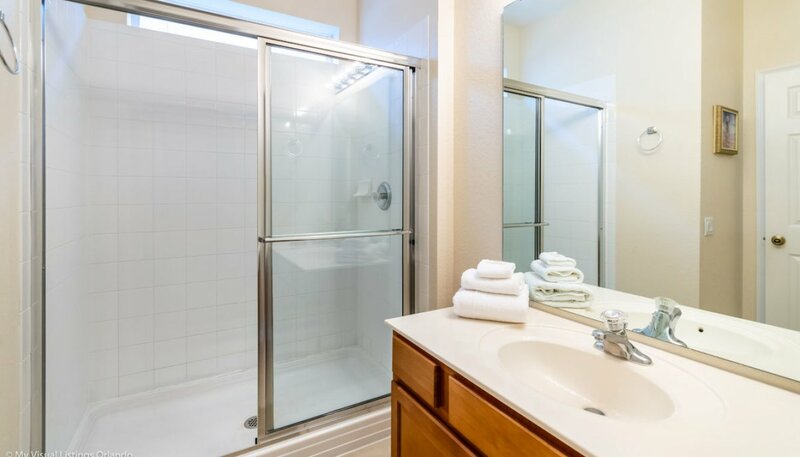 The enclosed ensuite bathroom has a large walk-in shower, his & hers vanity units and separate WC. 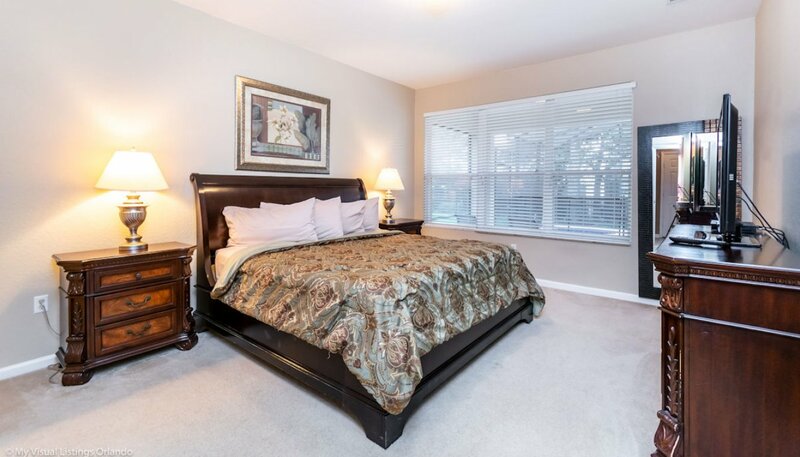 The second master bedroom with views onto front gardens is furnished with a queen sized bed with matching nightstands, chest of drawers with LCD cable TV above and built-in wardrobe. 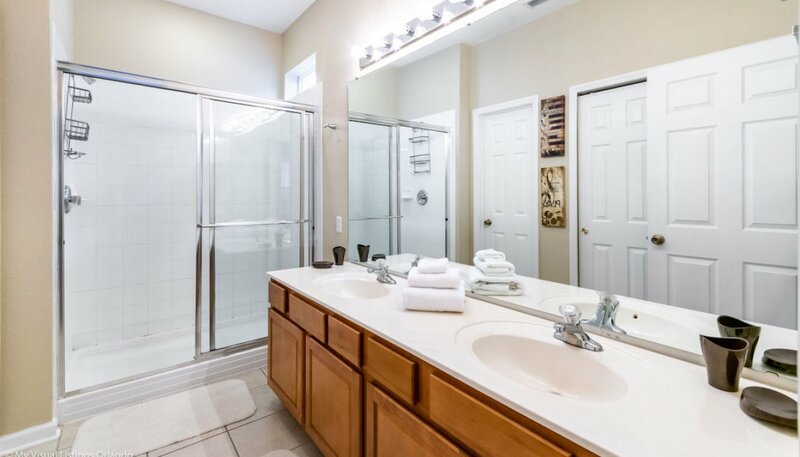 The enclosed ensuite bathroom has a large walk-in shower, vanity sink unit and separate WC. 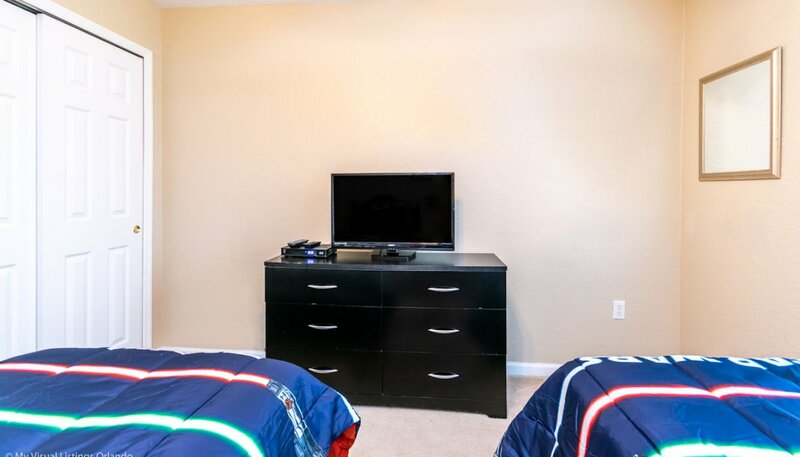 This bedroom features twin beds with matching nightstand, chest of drawers with LCD cable TV above and a built-in wardrobe. 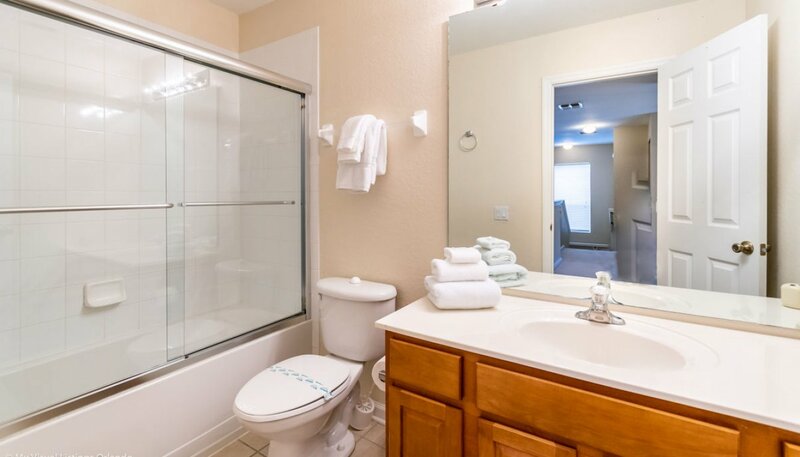 This shared bathroom on the ground floor features a bath with shower over, single vanity unit and WC. 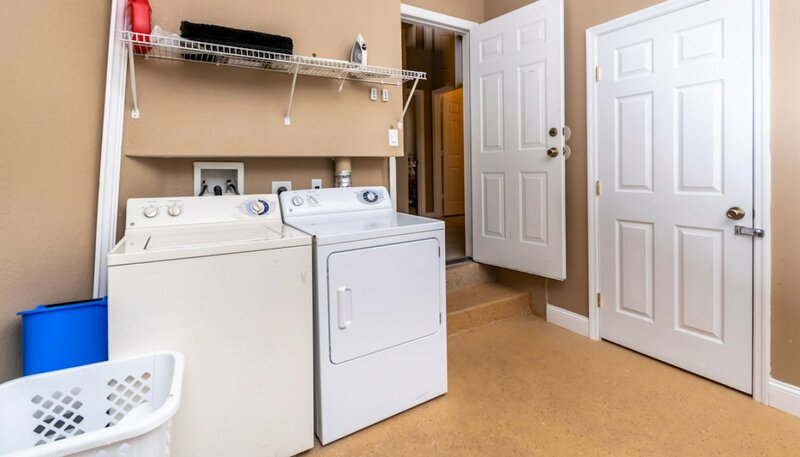 The laundry facilities are located in the garage and includes a washing machine, tumble dryer, ironing board and iron for your convenience - leave space in your luggage for all those cheap designer clothes you are likely to purchase at the fantastic malls !! 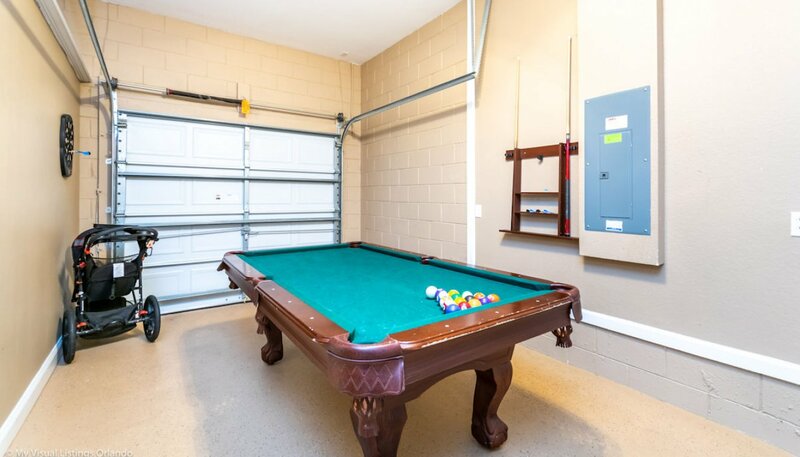 The converted garage is equipped with a pool table and dart board to keep the kids occupied when it's raining. 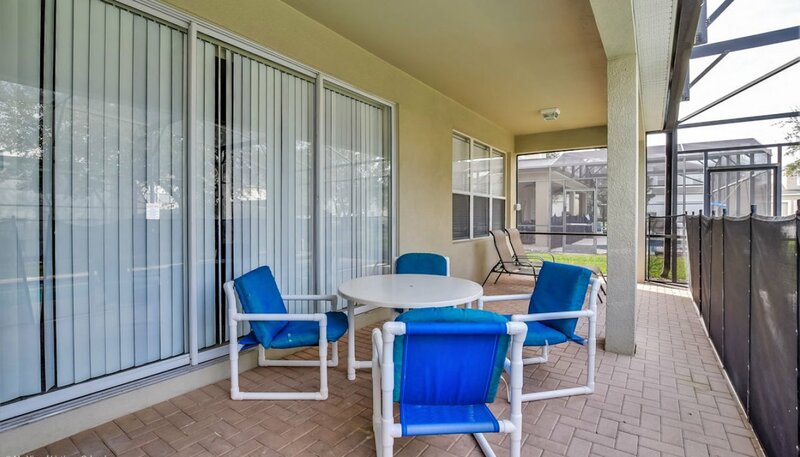 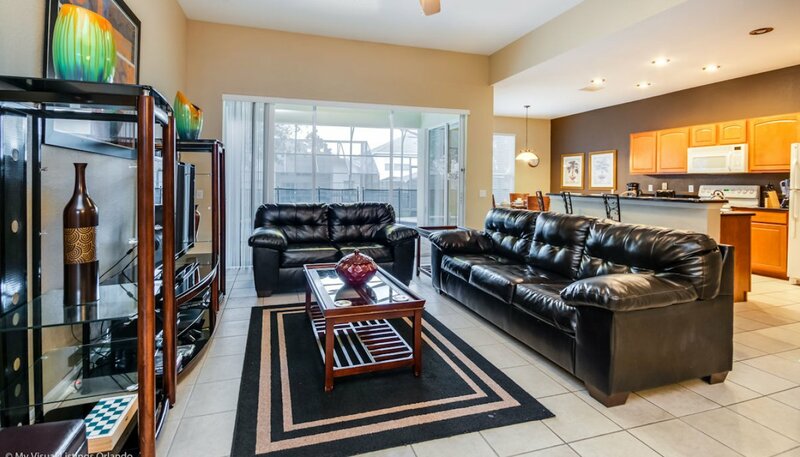 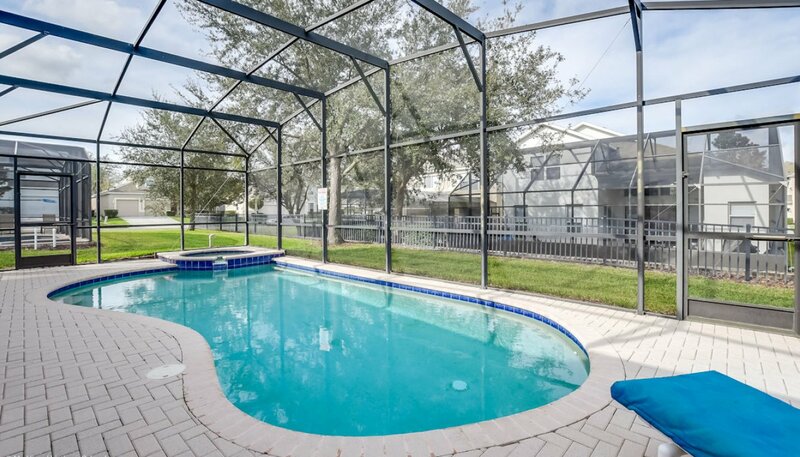 The large pool with north facing deck has 4 sun loungers for your sunbathing comfort and a round patio table with 4 chairs under the shady covered lanai. 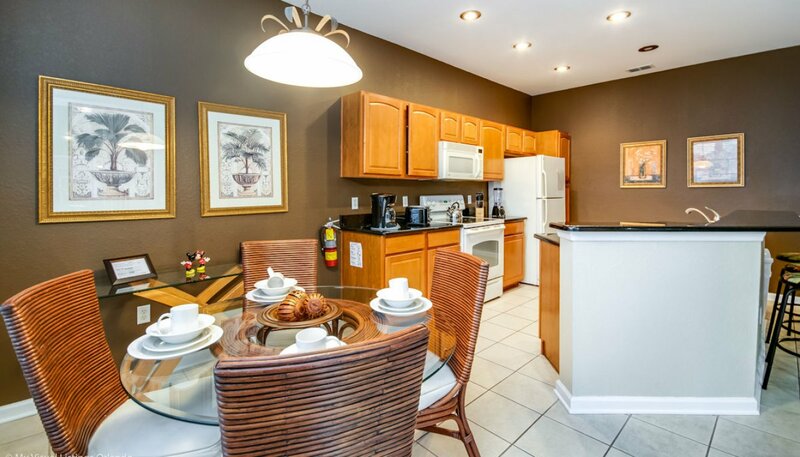 We provide free high-speed DSL WiFi internet access throughout the villa and pool deck. 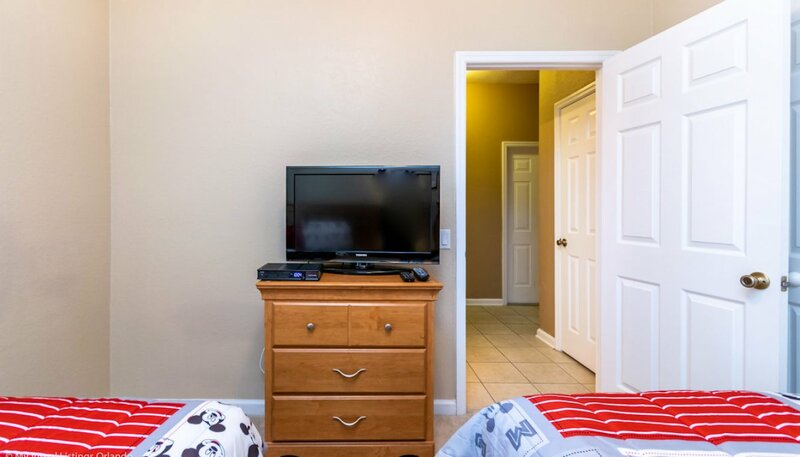 Just bring your own laptop, tablet or smartphone to connect to the internet and email. 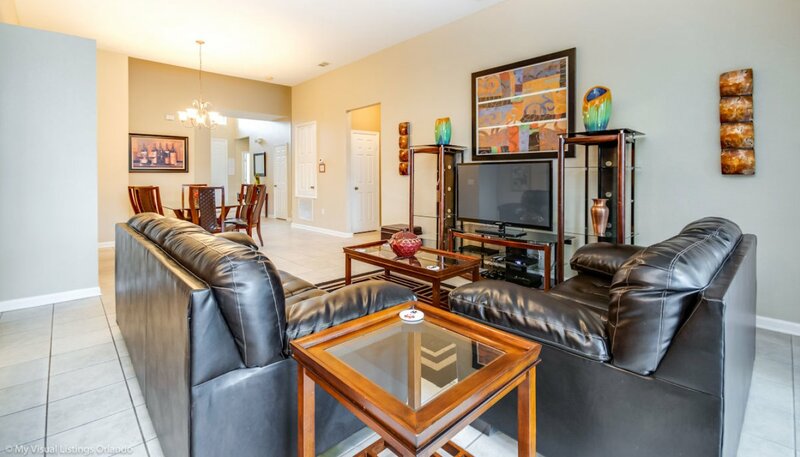 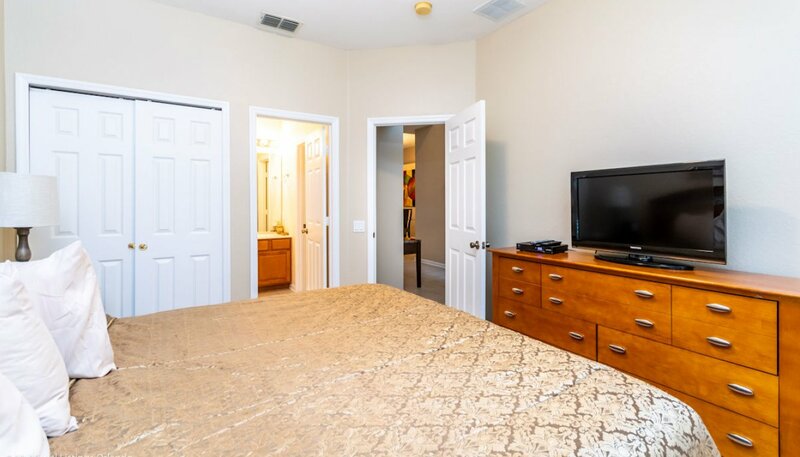 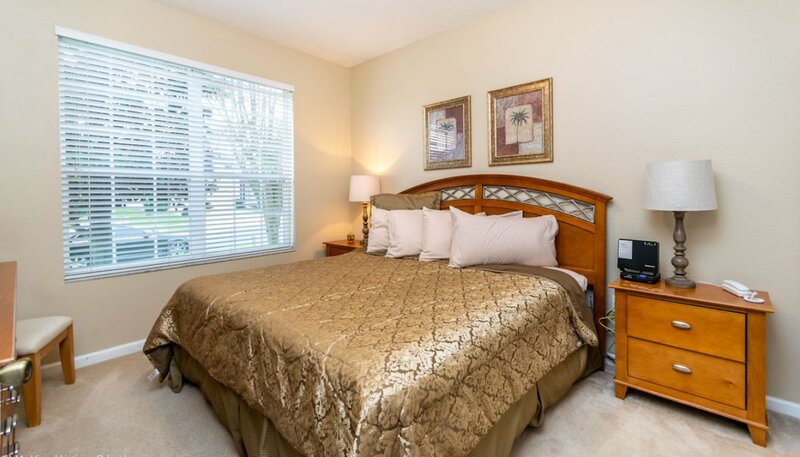 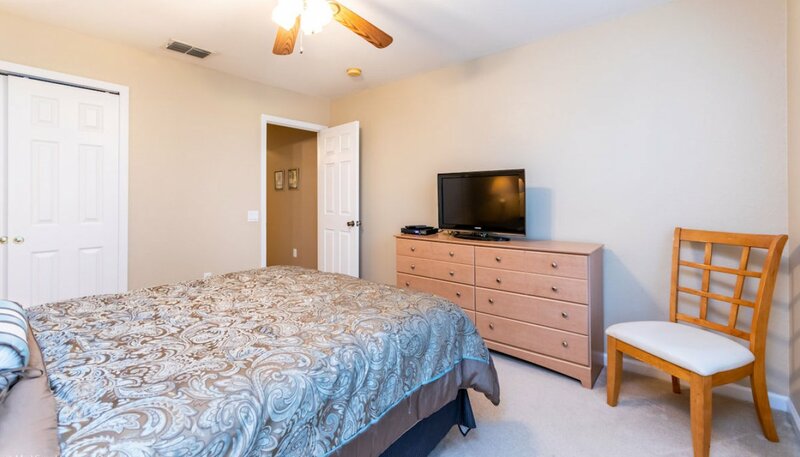 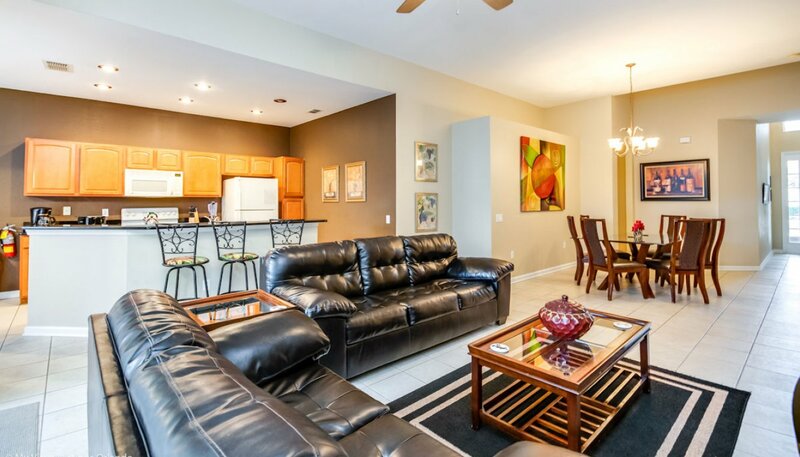 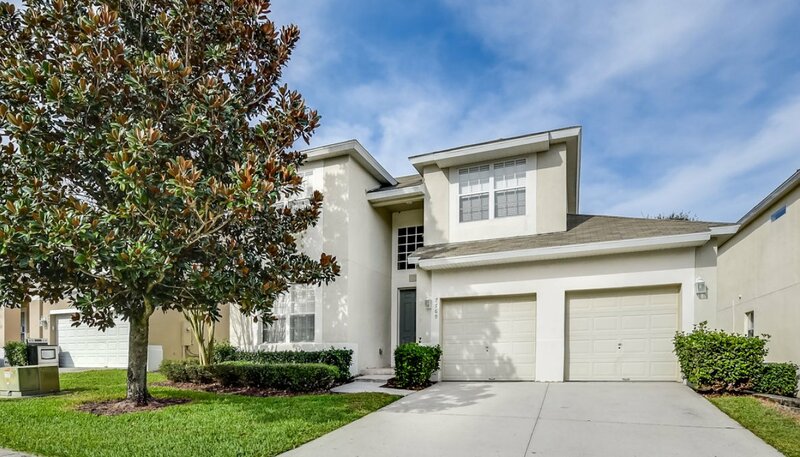 Approximately a 9 minutes walk to the excellent resort clubhouse and community pool. 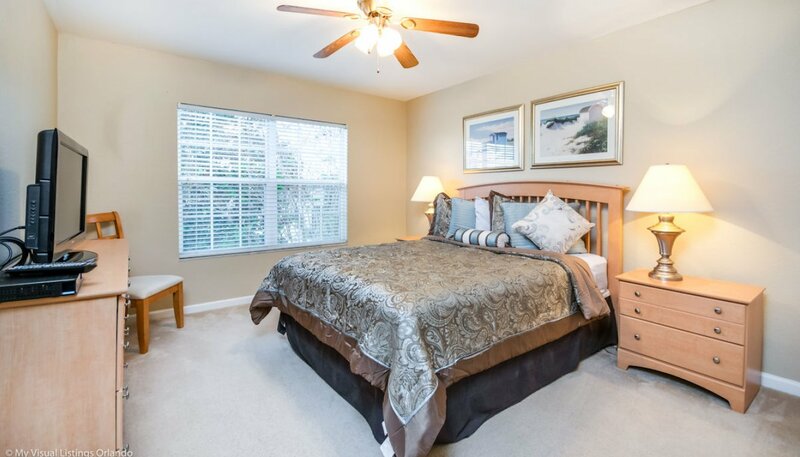 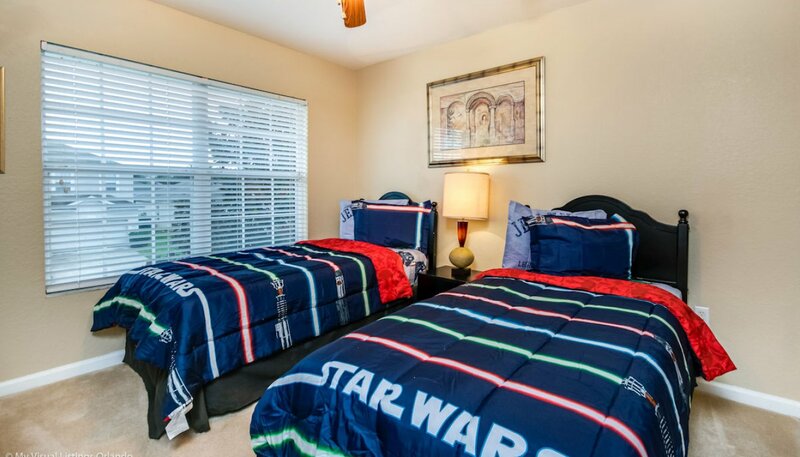 The bedroom has a queen sized bed with matching nightstands, chest of drawers with LCD cable TV above, ceiling fan and built-in wardrobe. 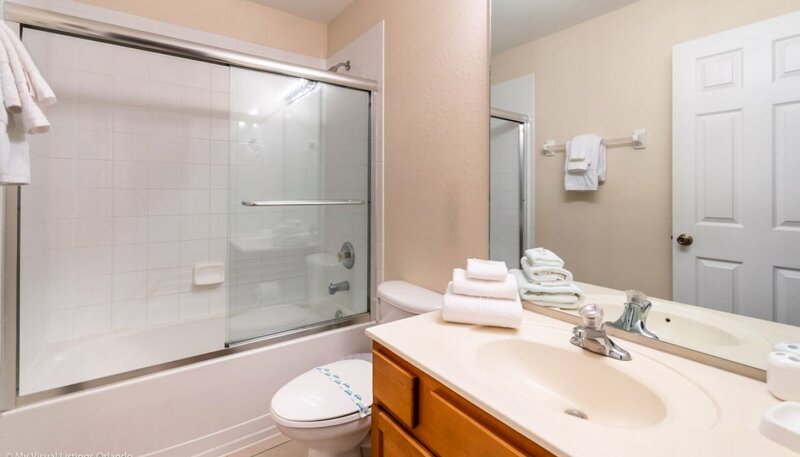 The adjacent ensuite bathroom has a bath with shower over, single vanity and WC. 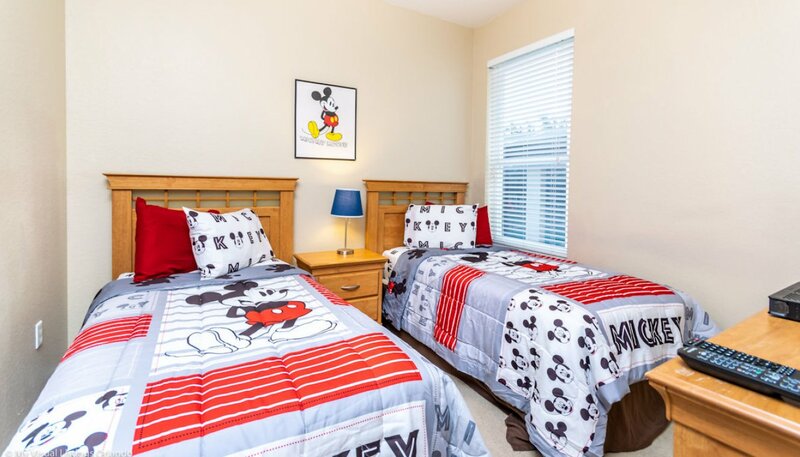 The bedroom has 2 twin sized beds with matching nightstand, chest of drawers with LCD cable TV above, ceiling fan and built-in wardrobe.